Objective: In this study, the diagnosis of infection caused by Vibrio anguillarum in cultured rainbow trout (Oncorhynchus mykiss), in Turkey using bacteriological, histopathological and immunohistochemical methods was attempted. Materials and Methods: 15 rainbow trout samples showing signs of disease were investigated using bacteriological and histopatological methods. Results: Because of physiological and biochemical characteristics of bacteria growing on the medium, these bacteria were isolated and identified as V. anguillarum. As a result of the histopathologic examination of the tissues of diseased rainbow trout, hyperemia in the liver, degeneration of the epithelium of kidney tubules and necrosis in the interstitial area, enlargement in the gill filaments, cells having picnotic nucleus and several necrotic areas in the spleen were observed. It was also detected in the streptavidin-biotin staining method that the causative agent accumulates in the liver, spleen, kidney and also in the gills especially in the areas near around the blood vessels depending on the development stage of the disease. Conclusion: As a result, an immunoenzimatic method, streptavidin-biotin staining method was used in this study for the detection of the presence of V. anguillarum in the infected rainbow trout tissues. TUIK, 2018, http://www.tuik.gov.tr/PreHaberBultenleri.do?id=10863 , 22.01.2018. Austin B. and Austin D.A. (2012) Bacterial fish pathogens: Disease of farmed and wildfish, 5th edition. Springer, New York, 978-94-007-4884-2. Roberts RJ. (2012) Fish pathology 4thedition, Wiley-Blackwell, 978-1444332827. Toranzo A.E., Magarinos B. and Romalde J.L. (2005) A review of the main bacterial fish diseases in mariculture systems, Aquaculture, 246 (1-4), 31-67. Richards R.H. and Roberts R.J. (1978) The bacteriology of teleost, Fish Pathology,Baillere Tindall, London, England, 0702006742. Timur G. and Korun J. (2004) First outbreak of vibriosis in farmed rainbow trout (Oncorhynchus mykiss) in Turkey. Istanbul University Journal of Aquatic Sciences, 18, 1-9. Tanrıkul, T. T., Çağırgan, H., Toksen, E., 2004, Identification of isolated Vibrio sp. from sea bass (Dicentrarchus labrax L., 1758) using API 20 E System, Ege University Faculty of Fisheries Journal of Fisheries and Aquatic Sciences,21 (3-4), 247. Afonso A., Gomes S., Silva J., Marques F. and Henrique, M. (2005) Side effects in sea bass (Dicentrarchus labrax L.) due to intraperitoneal vaccination against vibriosis and pasteurellosis. Fish & Shellfish Immunology. 19 (1), 1-16. Paperna I., Colorni A., Gordin H. and Kissel G.W. (1977) Diseases of Sparus aurata in marine culture at Eliat. Aquaculture, 10, 195-213. Korun J. (2006) Kültürü yapılan çipuralarda (Sparus aurata L.) görülen Listonella anguillarum enfeksiyonu üzerine bir çalışma. Ege Üniversitesi Su Ürünleri Dergisi, 23(1), 2. Frerichs G.N. and Roberts R.J. (1989) The Bacteriology of Teleost, R. J. Roberts (ed), Fish Pathology, London, Baillière Tindall, 978-1-4443-3282-7. Bergh O., Vikanes L., Makridis P., Skjermo J., Knappskog D. and Rødseth O.M. (2001) Uptake and processing of a Vibrio anguillarum bacterin in Artemia franciscana measured by ELISA and immunohistochemistry. Fish & Shellfish Immunology, 11 (1), 15–22. Culling C.F.A. (1963) Handbook of histopathological techniques (Including Museum Tecnique) Second Edition, Butterworth&Co. (Publisher) Ltd., London. Hinton D.E. (1990) Histological techniques, methods for fish biology, American Fisheries Society, Maryland, USA, 0-913235-38-X. Yilmaz O., Oztay F. and Kayalar O. (2015) Dasatinib attenuated bleomycin-induced pulmonary fibrosis in mice. Growth Factors, 33(5-6), 366-375. Tanrıkul T.T. (2007) Vibriosis as an epizootic disease of rainbow trout (Oncorhynchus mykiss) in Turkey, Pakistan Journal of Biological Sciences, 10 (10),1733-1737. Bolinches J., Toranzo A.E., Silva A. and Barja, J.L. (1986) Vibriosis as the main causative factor of heavy mortalities in the oyster culture ındustry in northwestern Spain, Bulletin of the European Association of Fish Pathologists, 6, 1-4. Avcı H., Birincioğlu S. and Çağırgan H. (2012) Pathological and immunohistochemical investigations in rainbow trout (Oncorhynchus mykiss Walbaum, 1792) experimentally infected with Vibrio anguillarum, Revue de Medecine Veterinaire, 1 (163), 31-39. Planas M., Perez-Lorenzo M., Hjelm M., Gram L., Fiksdal I.U., Bergh O. and Pintado J. (2006) Probiotic effect in vivo of Roseobacter strain 27-4 against Vibrio (Listonella) anguillarum infections in turbot (Scophthalmus maximus L.) larvae. Aquaculture, 255(1-4), 323–33. Shi Z.R., Itzkowitz S.H. and Kim Y.S. (1988) A comparison of three immunoperoxidase techniques for antigen detection in colorectal carcinoma tissues. Journal of Histochemistry & Cytochemistry, 36(3), 317-322. Grisez L., Chair M., Sorgeloos P. and Ollevier F. (1996) Mode of infection and spread of Vibrio anguillarum in turbot Scophthalmus maximus larvae after oral challenge through live feed. Diseases of Aquatic Organisms, 26, 181-187. Mutoloki S., Alexandersen S., Gravningen K. and Evensen Q. (2008) Time-course study of injection site inflammatory reactions following intraperitoneal injection of Atlantic Cod (Gadus Morhua L.) with oil-adjuvanted vaccines, Fish & Shellfish Immunology, 24 (4), 386-393. Laurencin F.B. and Germon E. (1987) Experimental ınfection of rainbow trout, Salmo gairdneri R., by dipping in suspension of Vibrio anguillarum: ways of bacterial penetration; influence of temparature and salinity, Aquaculture, 67, 203-272. ISNAD Akaylı, Tülay , Aydin, Buket , Urku, Cigdem , Kayalar, Ozgecan . "Diagnosis of Vibrio anguillarum in Cultured Rainbow Trout (Oncorhynchus mykiss) by Different Methods". 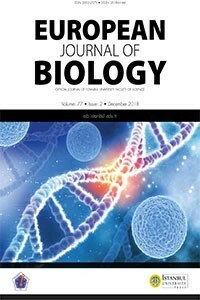 European Journal of Biology 77 / 1 (June 2018): 26-31.